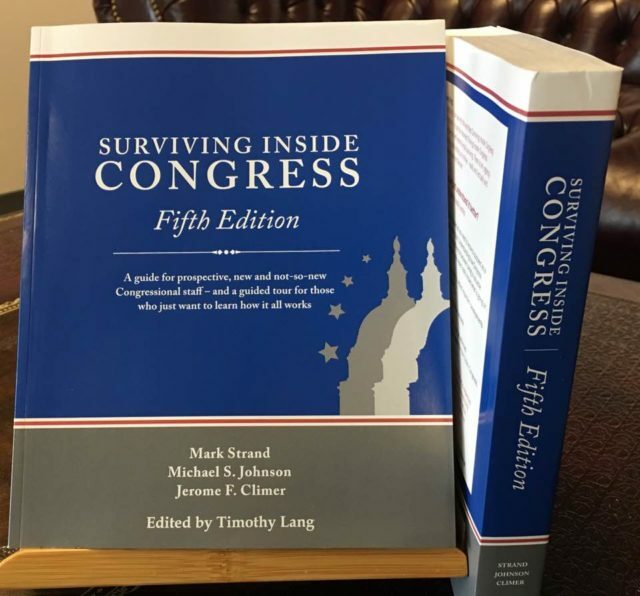 The Congressional Institute is pleased to release the fifth edition of Surviving Inside Congress, its signature guidebook to life on Capitol Hill. Surviving Inside Congress explains the origins of Congress, crucial events in its development, how it operates today and why. It discusses the difference between personal, committee and leadership offices and the different staffers in each office. It offers an introduction to how a bill becomes a law and House and Senate Floor procedure. It treats the development of the media and provides principles for working with the media and best practices, especially online. One of the most important chapters discusses partisanship, polarization, and how to turn Congress around. Surviving Inside Congress has been revised and expanded to reflect important developments during the 114th Congress. Updates include a new chapter on the President’s role in the legislative process; new research on social media best practices; how and why Congress is dysfunctional; and how the public views Congress. Most new staffers are ill equipped to handle the demands of their jobs. That’s not a criticism – there is no job in the world like working on the Hill. There are few comprehensive training programs and no curriculum that adequately addresses the roles they play. Surviving Inside Congress attempts to remedy the dearth of reference materials for staff. It offers clear and concise pointers to what it takes to succeed on Capitol Hill, work effectively with colleagues and the public, and stay free from ethics violations. However, Surviving Inside Congress is not only helpful for new staff. Anyone can learn a lot about the Congress by reading it. It is an excellent resource for government-relations professionals, students and anyone who wants to know more about Congress. One aspect of the Congressional Institute’s mission is to help Members of Congress and staffers serve the public more effectively. To help achieve this goal, we will provide any Member or staffer a copy of the Surviving Inside Congress upon request. Staff may request a copy by sending an email from their official government email address with their name, title, and office to book@conginst.org. Copies of Surviving Inside Congress may be purchased on the Congressional Institute website or Amazon.com. Understanding how Congress really works—or doesn’t, as the case may be—is the difference between being a valuable contributor to the nation’s work and being an outsider who never really knows what’s going on. Surviving Inside Congress shows the way.